GCWP implements a mosquito program on a yearly basis with funding from the Emergency Insect Management Grant administered by the Wyoming Department of Agriculture. Our goal is to monitor and treat densely populated areas with a high-risk factor of contracting West Nile virus. Why does GCWP MOnitor mosquitoes? 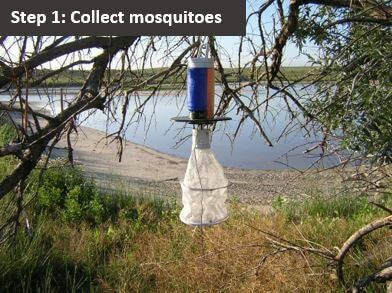 The main goal of the mosquito program is to monitor the population of mosquitoes which transmit West Nile virus (WNV). While only certain mosquito species transmit this virus, they happen to be common in Goshen county due to our climate and irrigation. Mosquitoes within the Culex genus, specifically Culex tarsalis, are the main vector for WNV. To monitor these mosquitoes, we collect specimens from areas known to have high Culex populations. These collections are typically taken on a weekly basis to determine the presence of WNV and the effectiveness of treatment. 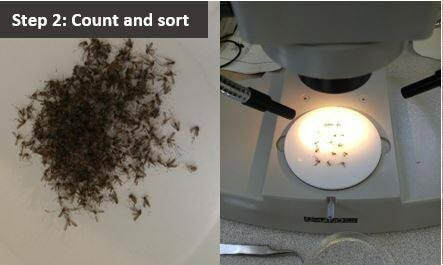 Once mosquitoes are trapped, they are sorted by genus and the Culex mosquitoes are tested for WNV. A weekly report published by the Wyoming Department of Health can be found here. Culex mosquito populations are highest in late summer when temperatures are hot. Since these are the specific mosquitoes we are targeting to prevent the spread of WNV, treatment timing is based on Culex populations. There are over 50 different species of mosquitoes just in Wyoming! GCWP monitors the presence of West Nile virus by testing collected mosquitoes. Here is a summary of the process! 3. Add 30 Culex mosquitoes, 1.0ml buffer solution, and 2 copper-coated ball bearings to dilution vial. Vortex 1-5 minutes or until there are no whole mosquito parts. 4. 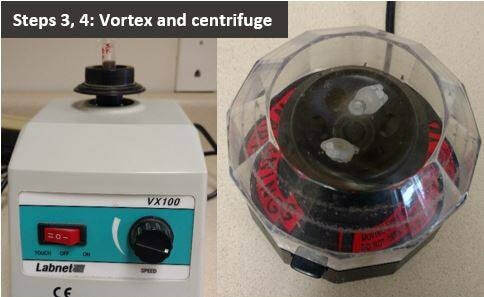 Centrifuge sample for 3-5 minutes. 5. Transfer 120 microliters into empty buffer vial. 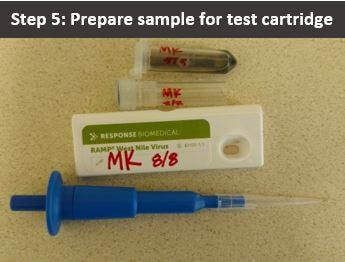 Using assay tip, mix sample 10 times then draw 10 microliters into assay tip and dispense into sample well of the test cartridge. 6. Dry sample at room temperature for 90 minutes then insert into RAMP instrument. How can i protect myself from WNV? Information is the greatest defense against West Nile virus! Our educational pamphlet will help you understand the life cycle of mosquitoes, how WNV is contracted, and how you can protect yourself by following the 3 D's. Through our monitoring efforts, we have over a decade of mosquito population data. Some areas are likely to have more mosquitoes! Check out our pamphlet and map below to learn more! There are several products available to help control the mosquito population. If you have standing water (i.e. ponds, bird baths, stock tanks, etc. ), we encourage the use of a larvacide treatment. These products contain a naturally-occurring bacteria, Bacillus thuringiensis (BTI), which is very safe for non-targets such as humans, livestock, and other insects. Most BTI products available at GCWP are FREE! Control mosquito larva before they get a chance to bite you! GCWP helps with mosquito control by organizing aerial applications, monitoring mosquito populations, providing residents with larvacide, and ULV (fogging) applications. GCWP is affiliated with the Wyoming Mosquito Management Association and attends public events to provide information on mosquito control methods and prevention of WNV. For municipalities GCWP provides insecticide, equipment, and technical assistance. Incorporated towns (Torrington, Lingle, Fort Laramie, LaGrange, Yoder) operate an independent control schedule.